Is This Glass Half-Empty, Half-Full, Or Is It Full? Test Your Success Mindset! So… you think you have a success-mindset. You always look for the positive. You count your blessings at the end of each day. 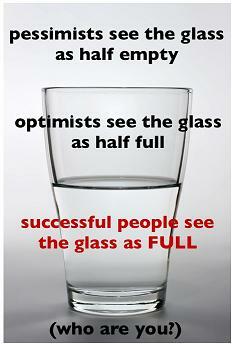 You never see the glass as half-empty, it’s always half-full. So why are you not getting the results you want? Why isn’t your ideal future here yet? What’s missing in this picture? I am going to answer that, but first let me tell you a short story I heard recently about…a car salesman. Yep, a car salesman. From Detroit, I believe. I was listening to the radio as I was driving home from town in the rain one evening, my windshield wipers swishing rhythmically back and forth. The interviewer described a man he’d discovered recently who was in the top 10 in his industry for sales… out of 29,000. The interviewer wanted to know: What made this guy tick? His clothes were not really an indication: sure, he dressed nicer than most of the sales guys on his floor (he wore a nice suit, bow-tie and gelled hair every single day, instead of dressing casually)…but so did the other “top” guys from other dealerships he was competing against. His education level was not really an indication: he had a thick accent, and often struggled with simple vocabulary words. However, it was at one such moment in the interview – when he was struggling to think of a word – that the true indication of why he might be (WAY) more successful than the rest became apparent. “…Pessimistic?” supplied the interviewer, with a bit of a smirk in his voice (he obviously had a bit more education in his background). And the answer to that question, of course, is the answer to our question. What makes exceptionally successful people stand out from the rest? They don’t, actually, see the world around them like the rest of us. They don’t see the “reality” everyone else sees, either positively OR negatively. They see the world of the future. They don’t see where they are now, or what happened yesterday. They see where they want to go, who they want to be, tomorrow. Successful people see this picture so clearly in their minds, it becomes their reality…long before it’s become reality for anyone else. We call them “unrealistic.” But hey, why settle for reality, when you know you can do so much better? I call it the “Glass Full” principle. 1. Be Awesome. When someone asks you how you are doing, do not take a second to think about how your day has gone. Don’t go over the morning, how you got a parking ticket and so on. Simply reply without a second’s hesitation, “Awesome!” or “I’m doing terrific!” Say that often enough, and before you know it, it will be true. 3. Be Unrealistic. Before you go to bed each night, and after you get up in the morning (maybe while you’re brewing your coffee) look at that statement you wrote down. Imagine yourself there. Don’t worry if it’s “unrealistic.” It’s your future. What will you dress like? How will you feel? Who will you hang out with? Where will you go for dinner? Make the picture vivid. In fact, in hypnosis there is a technique I use called “The M Dial” where we create a picture of your future together, and then “turn the dial up” on it, make it go from black and white, to color, to technicolor. We make your vision bigger-and-brighter-than-life…until it IS your life. The glass can’t be full until you can imagine it that way. So if you want to rise above the crowd, don’t stop at being optimistic. Be unrealistic. See your life as totally, absolutely, brimmingly “full.” And before you know it, it will be. LIKE this article? SHARE it before you go! Tellman Knudson, CHT is a wealth hypnotist, barefoot runner and entrepreneur. He helps people become wealthier, healthier, happier versions of themselves with his new program The Wealth Method. Visit Tellman’s website.